Clark County School District police said there have been 7 incidents involving guns since the start of the school year, including an arrest Wednesday at Desert Rose High School. A 16-year-old student was arrested for possession of a loaded 9mm handgun. 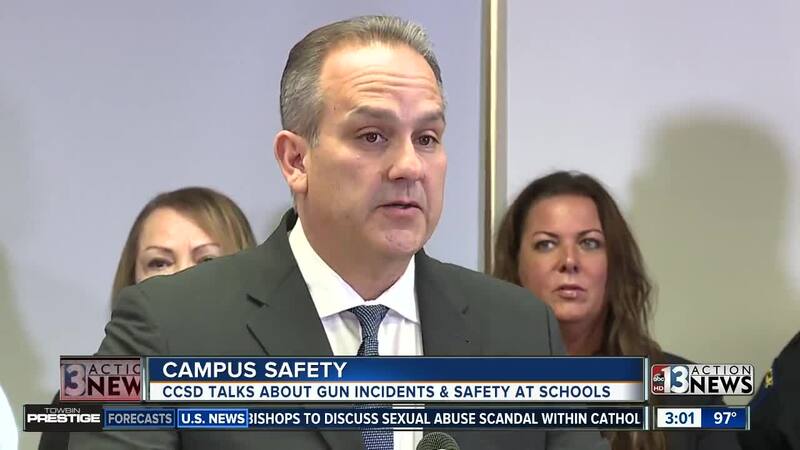 CCSD held a news conference Wednesday to discuss school safety and several recent cases of students bringing weapons to school. This came after a Canyon Springs High School student was shot and killed on the edge of school property Tuesday. He has since been identified as 18-year-old Dalvin Brown. Superintendent Jesus Jara called Tuesday's shooting "devastating" and said he has reached out to the student's family to offer his condolences. "As a father, I know how scary it can be to send kids to school," he said. Jara said he is creating an advisory group involving principals, teachers and students to suggest ways to address weapons on campuses. The new group is set to make recommendations to the Board of Trustees by Dec. 1. CCSD police say common denominators in gun cases are they were either used in another crime or not tracked by their owners properly. Other gun incidents involving students included a student arrested at Mojave High School last week . A student was arrested on Aug. 28 at Sierra Vista High School, a 16-year-old student was arrested Aug. 22 at Centennial High School for bring a loaded gun to school and another student was arrested Aug. 13 for bringing a gun to Green Valley High School. In addition, police included the arrest of a woman outside Chaparral High School who allegedly pulled out a gun during a student fight on Aug. 31. CCSD police said they are assigning an officer to work with the Las Vegas police gang unit but may reconsider restarting their own gang unit. 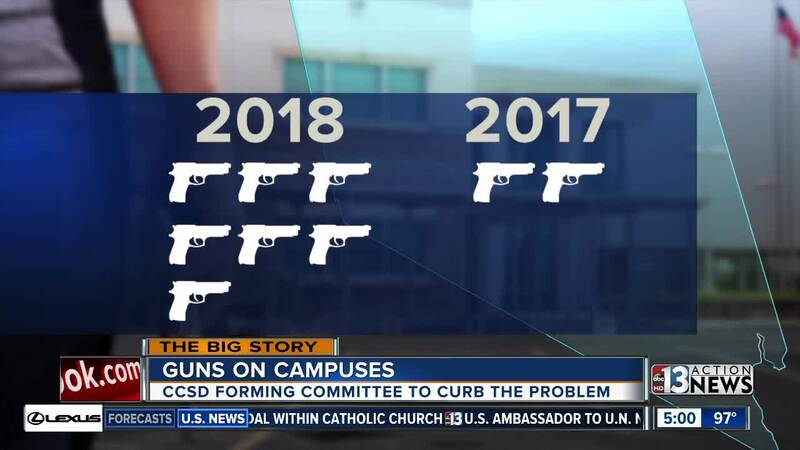 A representative with the Clark County District Attorney's Office said when guns are brought into school, the District Attorney's Office is going to take it seriously. During the press conference Wednesday, officials also discussed SafeVoice , a tip reporting system that includes and goes beyond bullying to create an anonymous way to report threats of school violence and friends at risk of suicide, drugs and more. Trustee Carolyn Edwards said there have already been 730 tips through Safe Voice since the start of the school year. She emphasized, "If you see something, say something."